How to Choose a New Carousel? 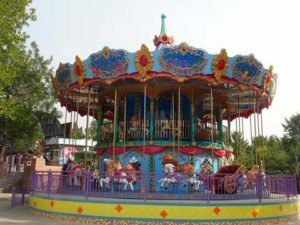 Carousel ride, there are multiple names that refer to this type of equipment, such as: Trojans, carousels, carousels, and so on. 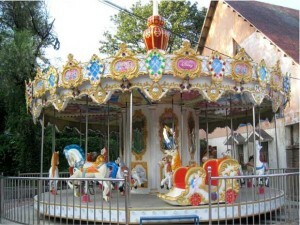 It is one of the most popular amusement park equipment. 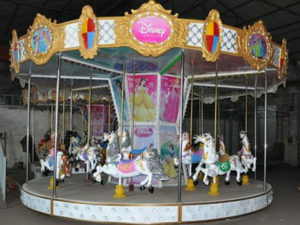 As the name implies, the carousel horse is to be turned, but the single rotation is not image, and now it can make it up and down. New carousel has a novel appearance and beautiful colors. It is a amusement machine that young friends are very fond of. After the start of the horse, the turntable rotates at a constant speed, and the horses of different shapes follow up and down, which makes the rider feel the vertical whip and the battlefield. The product is made of FRP material and has the characteristics of environmental protection, safety, corrosion resistance and good stability. It can be customized according to the site conditions. 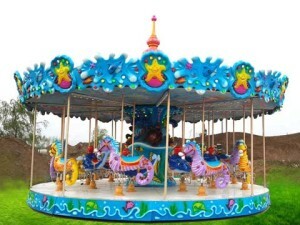 The transfer carousel is suitable for densely populated places such as park playgrounds, children’s palaces, living squares and communities. 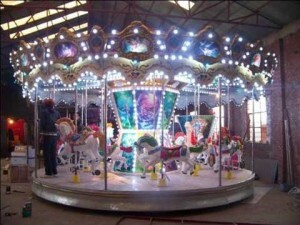 The main body of the carousel is made of steel. 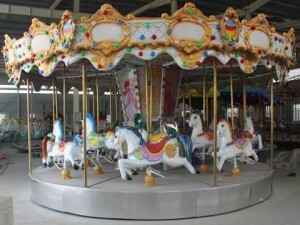 The carousel and carousel horse is made of FRP material. It has the characteristics of environmental protection, safety, corrosion resistance and good stability. It can be customized according to the site conditions. Horse specifications: 8 seats, 12 seats, 16 seats, 24 seats, 36 seats; according to the degree of decoration can be divided into simple horses, luxury horses and luxury horses. According to the transmission mode, it can be divided into the lower transmission horse and the upper transmission horse. The horse must have a beautiful appearance, colorful lighting and wonderful music. The first impression of the customer is very important, which is what we often call “pre-emptive”. Today, the market is fiercely competitive. Imagine the same amusement. In the field, several horses are operating at the same time. Whose horses can attract customers’ eyes, which will inevitably bring a lot of business. We often see a phenomenon in the playground is also a ride, some business It’s hot, and some of them are so good. The reason is that the appearance of the amusement equipment is attractive. It is the first element. 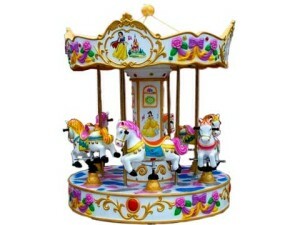 Beston’s carousel horses are novel in style and bright in color. Among them, Beston’s dream sea tour is our exclusive patented product, unique. 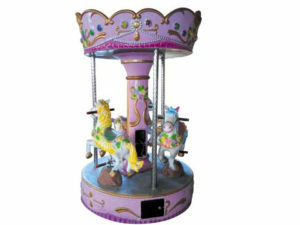 The quality of the horse, there is no need to question, because if any amusement equipment can not give the quality assurance to the customers when they play, everything is stunned. When you play with a happy mood, suddenly there is a quality problem, is it very What is the scenery? Even when there is a security affair, it is not only a matter of making money, but a matter of losing money. To attract customers for a long time, the quality of products must be excellent. Qiledi has its own R&D team and a skilled processing team. The reasonable design and serious and responsible production process make the Beston horse more durable! This is the core of the whole carousel equipment. If the motor is not up to standard, it will not be qualified. If a horse is full according to the rated occupant, it may not be carried. If it is forcibly driven, the result is tire tire and motor capacitor. Burning and other conditions, this is a very bad phenomenon for both customers and operators. Beston uses brand-name motors to solve all problems in this area. Using unqualified motors will affect customers’ feelings. On the other hand, it will bring you a small maintenance cost and operating loss. Whether it is the upper drive or the lower drive, the drive is only an important part of the motor, and the core of this part is the connecting rod. The upper and lower undulations of the two rows of horses are all connected to the connecting rod, so the connecting rod part must It can adjust the imbalance when the horse is turning, so as to avoid the broken link caused by the unadjustable. Paint effect must be fresh, bright, light, glass fiber reinforced plastic products, only automotive special paint can achieve such an effect, Beston uses automotive special paint printing, the color is bright and lasting, if the paint effect is dull, the work is very rough The wind and the sun are less than half a year, and it will definitely fade, because the preliminary work is not done well, and the later effect must be very poor. 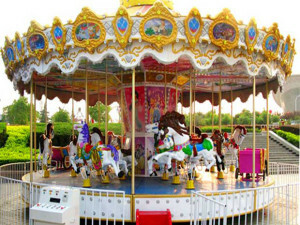 The decoration of a carousel is all about the FRP part, so the paint must be fine, fine and bright.